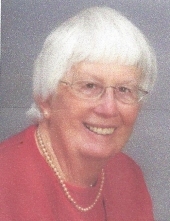 SR. MARY JANE MASTERSON, CSJ, formerly Sr. Judith. A member of the Congregation of St. Joseph with whom she shared 74 years. Beloved daughter of the late William and Nellie (nee Tully) Masterson; loving sister of the late Regina Masterson Gorie and William Masterson Jr. Entered Eternal Life October 25, 2018. Funeral Mass Monday November 5, 2018 at 3:00 PM in the St. Joseph Worship Space, 3430 Rocky River Dr., where friends may call on Monday from 1:00 to 3:00 PM. Interment Tuesday November 6, at Calvary Cemetery at 10:00 AM. Memorial contributions in her name may be made to The Congregation of St. Joseph. "Email Address" would like to share the life celebration of SR. MARY JANE MASTERSON CSJ. Click on the "link" to go to share a favorite memory or leave a condolence message for the family.